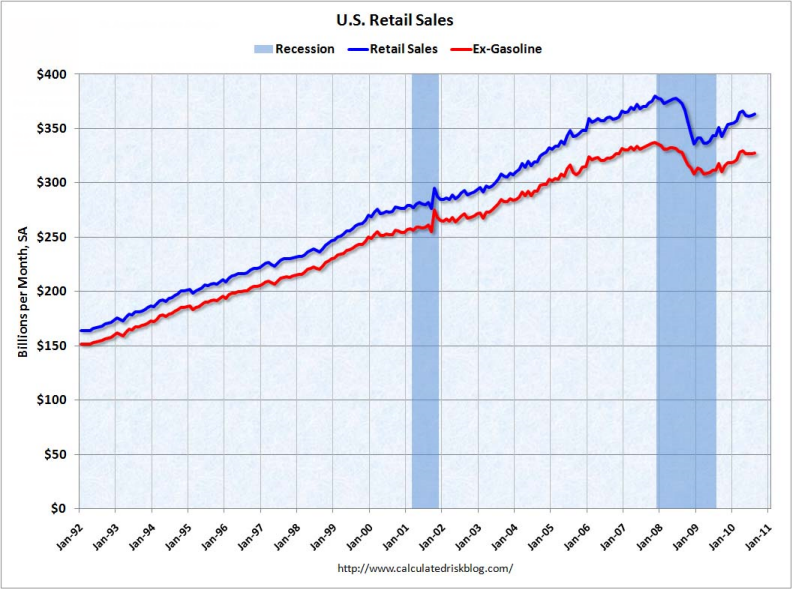 Mish's Global Economic Trend Analysis: Retail Sales Rise .4% from July - How Far to Pre-recession Levels? Where to from Here? 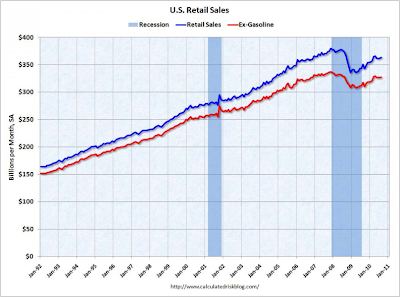 Retail Sales Rise .4% from July - How Far to Pre-recession Levels? Where to from Here? Although that is what the data says, I don't buy it. 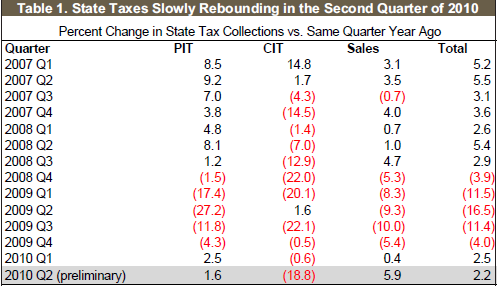 If retail sales were back to within 4.3% of the pre-recession peak, sales tax collections would be back towards the pre-recession peak, if not exceeding the pre-recession peak. The Nelson Rockefeller Institute reports State Tax Revenues Are Slowly Rebounding. However, as always, the devil is in the details. Let's take a look. 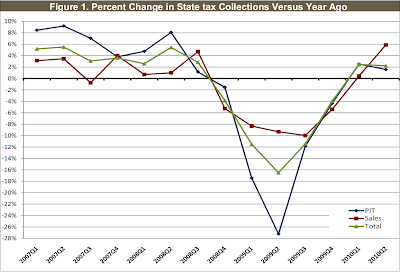 In spite of numerous sales tax hikes, tax collections are still 5.9% lower than two years ago. Moreover, June of 2008 was not the pre-recession peak. November of 2007 was the pre-recession peak. Bear in mind the Rockefeller reports are from June and Calculated Risk's charts are for August, but that would barely dent the comparison, if at all. The proper conclusion is that retail sales are down 10% or more from the pre-recession peak, especially if one factors in tax hikes. Many states look at the Census report trying to figure out why their sales are lagging the national averages. The problem is the Census Bureau national averages are a blatant distortion of reality. The key to the states' conundrum is Census Bureau sampling methodology does not take into consideration stores that have gone out of business. Sales tax collections obviously do. Closed stores make no sales and collect no taxes. I wonder how long it will take the Census Bureau to do a major revision, but as it sits, the retail sales report data is totally screwed up and paints a much brighter image of the "recovery" than has actually occurred. 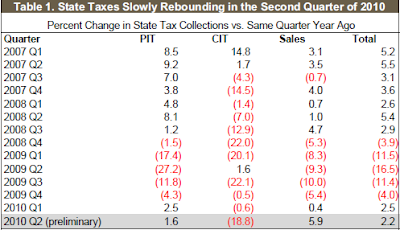 In a genuine recovery, new stores would be opening and the data would be off in the other direction, with sales tax collections expanding faster than reported by the Census Bureau. The number of store closings has probably peaked and that will make census reporting a bit more accurate going forward. Currently all sign point to a renewed consumer slowdown. 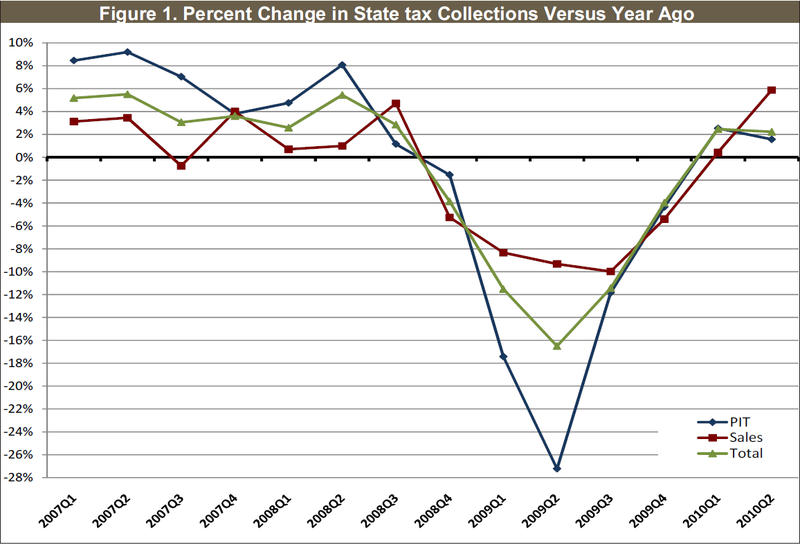 Thus, I suspect state tax collections will soon start to drop. With census bureau year-over-year comparisons starting to get more realistic, I expect to see that drop show up in the Census reports as well, even though the Census charts will remain totally screwed up from all the store closings in 2008-2009.